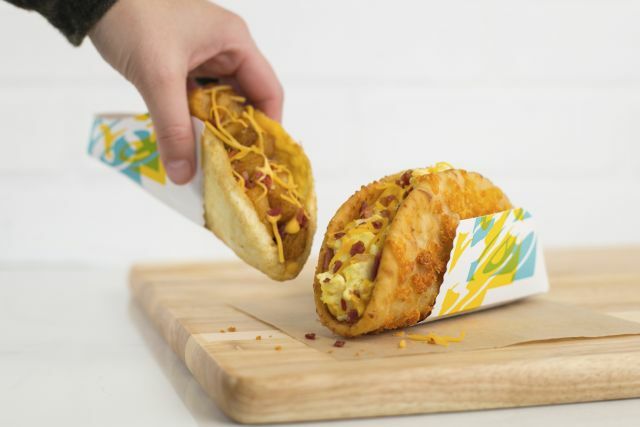 Taco Bell is bringing back the Naked Egg Taco nationwide starting March 8, 2018. On the same day, they'll also start testing the new Toasted Cheese Chalupa shell in areas of West Virginia. The Naked Egg Taco (my review here) features a fried-egg shell filled with either bacon or sausage plus seasoned potatoes, cheddar cheese, and nacho cheese sauce. You can get one for $1.99, the same price as when it was first introduced late last summer. This time around, Taco Bell is also running a slight discount where you can get two Naked Egg Tacos for $3.49. As before, a "dressed" version is also available where they cover up the Naked Egg Taco with a Gordita flatbread. The Breakfast Toasted Cheese Chalupa (and regular Toasted Cheese Chalupa) will be testing in Charleston, WV as well as Huntington, WV. The price for one is $2.49 but the regular version will also come in a $5 Box which includes a Toasted Cheese Chalupa, two crunchy tacos, and a medium drink for $5.